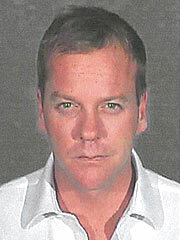 Kiefer Sutherland surrendered to jail Wednesday to begin a 48-day sentence for his DUI arrest. Sutherland, 40, was processed into the jail in Glendale, Calif., a Los Angeles suburb, at 5:46 p.m., according to the L.A. County Sheriff's Department. Sutherland will be assigned to laundry and kitchen duty, serving breakfast, lunch and dinner to the other inmates. As an inmate worker, he'll be allowed the roam the jail "about 75 percent of the time" � rather than be confined to his cell all day � though the only time he'll be in contact with other inmates is when he's serving food, said Balian. I appreciate you sharing this blog.Significantly thanks again. Hold creating.